﻿Gloria Barr Ford is a retired administrative assistant with Coastal Carolina University of Conway, SC. She is a native of North Santee located in Georgetown County, SC and so named for the Santee Indians that inhabited the area years earlier. 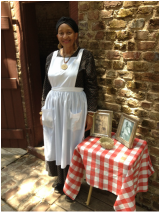 She is currently Thursday's Gullah presenter at de Gullah Theatre at Boone Hall Plantation. You can say that Gloria grew up “Gullah” having a great-grandmother who spoke fluent Gullah and told many Gullah stories including ones of her young life of being a slave. Her grandmother, mother, and other family members also contributed to her Gullah education and love for the language.